"These things are the best beer food ever. They're almost too easy to make." Preheat oven to 375 degrees F (190 degrees C). Line 2 pie plates with aluminum foil. Pinch about 1/2 teaspoon sausage off and roll into a small oval shape. Stuff the sausage piece into a pepper. Repeat with remaining sausage and peppers. 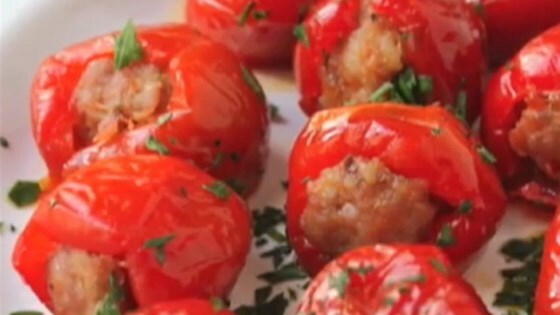 Drizzle 1 teaspoon olive oil into each foil-lined pie plate and divide the stuffed peppers into each one. Rotate the plates to roll and coat poppers in the oil. Roast poppers in the preheated oven until the sausage is cooked through and the poppers are very slightly dried out, about 20 minutes. Let cool before serving. Arrange onto a serving platter and sprinkle with parsley. One pound of sausage will fill about 60 peppers. We didn't care for them.They were okay, but missing something. These are so easy to make & are absolutely outstanding! Really liked these, used garlic cheese sausage, put in a bowl & sprinkled with fresh parmesan & parsley, didn't last long !! !